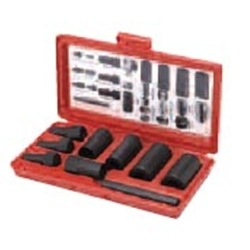 Nine Piece Wheel Cover & Wheel-Lock Removal Kit Ken Tool 30170 / BOWES KT 30170. Remove and replace GM, Ford, Chrysler hubcap locks and aftermarket wheel lug locks without the factory issued key. Save time! Will not damage the lock or stud.